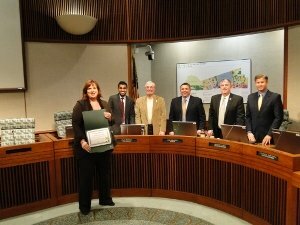 On February 4, 2014 Erin Winter received an outstanding Certificate of Appreciation and Recognition from the City Council of Dublin, for the support Hired Hands Homecare provides to the amazing City of Dublin Senior Center. Hired Hands is dedicated to involvement in the communities we serve and honored to have the opportunity to support the seniors of the Tri-Valley through sponsorship of the Dublin Senior Center. This senior center creates a warm environment and enriching activities and social interaction for approximately 200 seniors per day and is a shining example of community support and engagement of its senior population. We’re so proud of our California caregivers and our involvement in the community, and look very forward to the opportunity to support seniors and families throughout Dublin, Pleasanton, and the Tri-Valley area. Want to learn more about our California caregivers and our in home care services? Contact us today.